When you hear RighTrakers talk about relationship building, they often speak in terms of “investing” in people. It’s an appropriate metaphor. It requires intentionality, attention and patience, and whether we like to admit it, we expect some sort of return. (Just think of the one-sided, one-way “friendships” you’ve had and consider for a moment whether they were really relationships.) Relationships are mutual exchanges, but exchanges of what? In telling his own RighTrak story, Matthew begins to answer that question. Let me just say that this past year with Willie and the other members of this community we call RighTrak has been incredible. I decided to get involved and invest in Willie because I wanted to help him improve his life. However, it would be quite misleading if I made it sound like only he benefitted from me. In fact, I believe Willie has taught me more than I could ever teach him. Over the course of this past year Willie and I have developed a relationship in which I encourage him to persevere in his work and continue to lead a fulfilling life. This typically occurs while we’re experiencing life together. 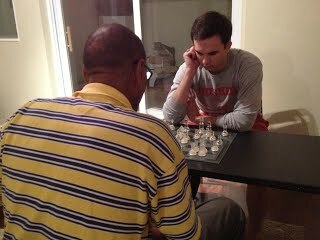 For example, we’ve played nearly weekly chess games, where Willie has schooled me and the two of us have enjoyed conversations that run the gamut—what God is saying to us, how he is speaking into our lives, where we are struggling and how we can pray for each other. Through these experiences, we’ve forged a friendship that I treasure greatly. Having a friend who consistently asks about such things, I believe, has encouraged Willie to not slip back into bad habits characteristic of his old life. Meanwhile, through this time spent with Willie, I have gained an incredible friend and learned so much about perseverance in trials and living out God’s will for your life. Willie is a true man of God and genuinely cares about his family, which now includes the RighTrakers. Willie has let God use his experiences—good and bad—to encourage me and help me through my own struggle with sin. Willie is never afraid to share his own experiences, so that I can see how far he has come with Christ’s help. I know that God has spoken into my life through Willie, and it has been a blessing. The best way I can put it is Proverbs 27:17: “As iron sharpens iron, so one man sharpens another.” Willie has sharpened me, and I him—this I never expected when I decided to “help” Willie.